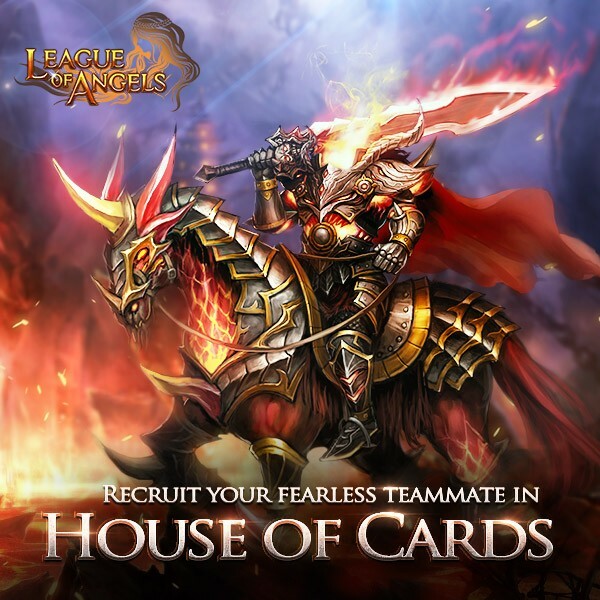 LoA_Recruit Fearless Hero in House of Cards! - You can swap the required cards for: Ghost Paladin( evolved from Headless Horseman), Headless Horseman, Kungfu Panda, Panda Nicky, Lunar Priestess, Dragon Queen, Poseidon, Amazon Hunter, Dark Paladin, Lvl.8 Dodge+Hit, Lvl.8 Crit+Hit Gem and many more! - Daily Ranking Rewards: Every day the Top 20 players with at least 1,500 points from the previous day can collect extra Card Points as the reward. - Total Ranking Rewards: At the end of the event, the Top 20 players with at least 5,000 total points have a chance to win Runestone, Joker (S), Gem Enhancement Stone, Element Crystal, Lvl. 8/7/6 Fusion Gem Chests. Description: Continuously draw 10 Cards for certain times within one day to get Flashy Cards and Joker (S)! Description: Continuously draw 10 Cards certain times during the whole event to get Flashy Cards and Flashy Joker (S)! Description: Use Flashy Cards to exchange many resources as follows! Description: Single Recharge certain amount to get extra rewards like King of Heart, Ace of Heart, Card Lotto Voucher, Hero's Mark, Flashy Ace of Hearts, and Joker (S). Description: Consume certain amount to get extra rewards like King of Spades, Ace of Spades, Card Lotto Voucher, Hero's Mark, and Joker (S). Description: Log in every day to win Card lotto Vouchers and other items! Description: Play Tidal Pool everyday to win extra Soulstones, Blessed Stone and many other rare items! More exciting events are coming up through Apr 15 to Apr 18 (Server Time) , check them out in the in-game Hot Events menu now! LoA_Angel Exclusive: Great Chance to Win Latest Angel!